Use webhooks to be notified about events that happen in a PLNAR account. PLNAR can send webhook events that notify your application any time an event happens on your account. This is especially useful for events—like creating, updating, or deleting projects, and new users/customers being added. You can register webhook URLs that we will notify any time an event happens in your account. When the event occurs—a project is created by a customer, a update is made to a preexisting project, your account is updated, etc. - PLNAR creates an Event object. This Event object contains all the relevant information about what just happened, including the type of event and the data associated with that event. PLNAR then sends the Event object, via an HTTP POST request, to any endpoint URLs that you have defined in your account’s Webhooks settings. You can have PLNAR send a single event to many webhook endpoints. Email a customer when a report has been submitted. Examine updated project assets when a change has occured in a report. 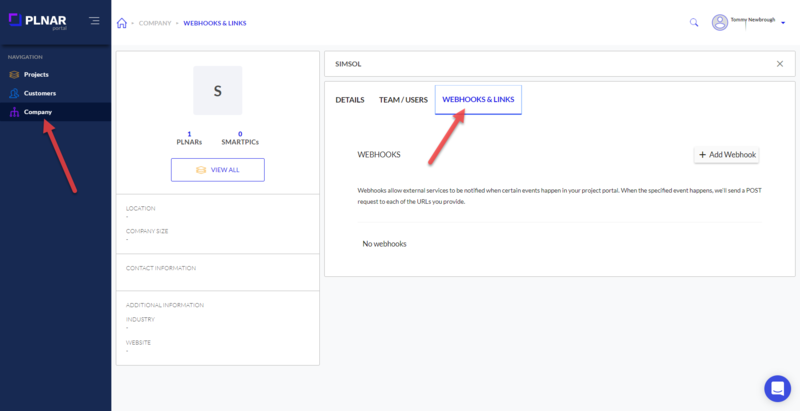 Webhooks are configured in the Company Details Webhook & Links section. Click Add Webhook to reveal a form where you can add a new URL for receiving webhooks. 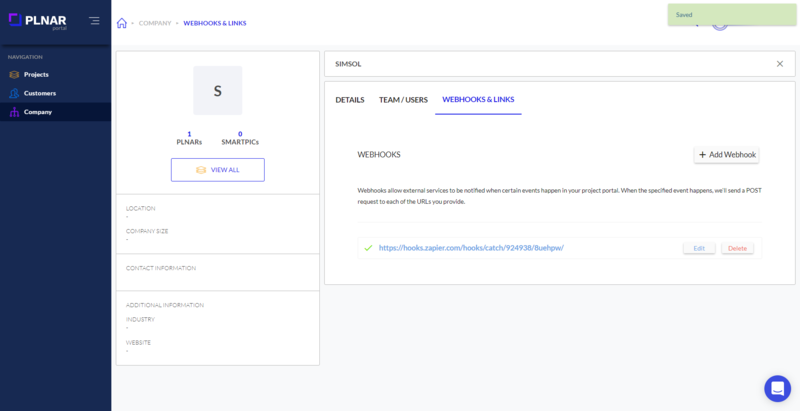 The two most common mistakes with webhooks are providing the wrong URL in the Dashboard and the webhook endpoint not returning a 200 status code. Creating a webhook endpoint on your server is no different from creating any page on your website. The PLNAR platform requires the use of an HTTPS URL for your webhook endpoint. A security check validates whether or not the connection to your server is secure before sending your webhook data. For this to work, your server must be correctly configured to support HTTPS with a valid server certificate.